Please click on the title bar of this post to see the comment box so that you can tell me, all my fans and your fans 3 or more book titles with authors’ names in your bibliography (whether you write fiction or non-fiction). 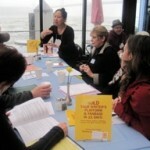 Cyberspace Coach Linda Lee reminds us the vitality of blogs. 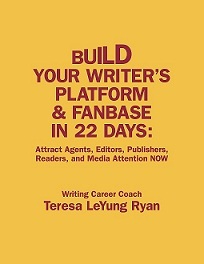 Plot Coach and Author Martha Alderson asked me to blog about building a platform/promoting novels. Martha, thank you for posting this subject. Promoting a novel or memoir is a major challenge because unless you are already a best-selling author or your publisher has committed a six-figure marketing budget for your book, how do you give your book the attention it deserves? Then, Anny Cleven (Area Marketing Director at Borders Books) reminded me that I was shedding light on ‘mental illness’ and ‘domestic violence’ in the Asian-American community. Kim McMillon, friend and colleague, pitched me to be a guest on KPIX “Bay Sunday” when she saw that I was ready to speak out on the issues. I became Teresa LeYung Ryan who advocates compassion for mental illness and the author who helps survivors of family violence find their own voices. 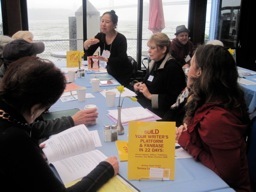 Now that I’m a career coach for writers, I encourage all my clients to build their platforms by articulating the themes in their stories as community/national/global concerns. Writers who have spent years working on their books (fiction or non-fiction) deserve recognition for their dedication. I want to see all diligent writers shed light on “the issues” and thus speak out for those who cannot speak for themselves. If you’d like a website or blog that speaks your messages, ask Linda Lee to design one for you.